5 health benefits and uses of Manuka honey. Due to its antimicrobial activity, nutritional profile, and anti-inflammatory and humectant properties, Manuka honey has a variety of health and beauty benefits when eaten or used directly on the skin. Here are some of the most promising, research-backed reasons to consider adding Manuka honey to your daily diet and natural skin care regimen. Manuka honey has been shown to have cosmetic benefits such as increasing the production of collagen (which in turn, increases skin elasticity), reducing dark spots, and acting as an anti-inflammatory, which may help calm inflammatory skin conditions like rosacea and acne. Due to its humectant properties (i.e., its ability to attract water to the surface of the skin as well as deliver hydration to the deeper layers), applying Manuka honey topically can also help skin retain moisture, making it a perfect addition to your beauty routine in cold, dry winter months. Try it: For a simple face mask, spread a tablespoon of Manuka honey over your clean face (avoiding the eyes). Leave it on for 20 minutes, then rinse with warm water. Pat your face dry and apply your favorite moisturizer or facial oil. For additional skin-brightening, acne-fighting benefits, mix the Manuka honey with a pinch of turmeric before applying. If you're struggling to catch some Zzzs, consider adding Manuka honey to your evening cup of herbal tea. Manuka honey contains high levels of tryptophan (also found in turkey, it's the same amino acid credited with making you drowsy after Thanksgiving dinner). Tryptophan, in turn, triggers the production of serotonin, which is a neurotransmitter that helps you relax and acts as a precursor to the production of melatonin, that all-important hormone that regulates sleep. Try it: Add a teaspoon of Manuka honey to your evening cup of chamomile tea or golden milk. What's more, Manuka honey is a powerful antibiotic—and one that could help treat skin infections otherwise considered untreatable, like methicillin-resistant Staphylococcus aureus (MRSA). There are currently no reports of microbial resistance to honey, and Manuka honey has specifically been shown to attack infections that have formed a biofilm—a stage that was once thought to render infections untreatable. In one study, the application of honey to diabetic foot ulcers was found to heal 43.3 percent of ulcers completely. Try it: For small, manageable cuts and scrapes, add a dab of Manuka honey directly to the skin before attaching your bandage. For larger wounds, always consult a doctor. Manuka honey is commonly associated with healing a sore throat. Not only do its antibacterial, antiviral, and antifungal properties create the perfect trifecta for treatment, but Manuka's thick, viscous texture coats and soothes the throat, helping destroy the harmful bacteria in its path. Manuka honey can help prevent coughs from keeping you up at night, too. One study found sleep conditions improved for both children and adults suffering from upper respiratory issues when they took honey before bed. Try it: Simply swallow a tablespoon of Manuka honey straight-up and allow it to coat your throat. 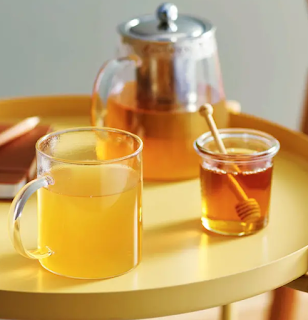 Alternatively (or additionally), you can add Manuka honey to ginger tea for extra anti-inflammatory benefits. Research suggests that Manuka honey has the ability to help with various digestive disorders. In animal studies, the high antioxidant content of Manuka has been effective in treating gastric ulcers and inflammatory bowel disease. Due to its antimicrobial properties, Manuka may also help fight pathogens in the gut. In two separate lab studies, both Clostridium difficile (C. diff) and Helicobacter pylori (H. pylori) were susceptible to the antibacterial properties in Manuka honey.